Are you looking for some free doll clothes patterns for an eleven-and-a-half-inch doll? Oh, it is so much fun making doll clothes. Little girls love to play with their dolls and collectors love to display them. Why not visit a time in history when women were ladies and dressed like it. They dressed in long feminine gowns and wore caps to protect their hair at times. These clothing patterns of the colonial times include your free patterns for these doll outfits. Just because the women were ladies does not mean they didn't have to work hard back then. Their dresses were of practical materials that would hold up under the wear and tear of everyday life. You can make the dresses the same way using the free doll clothes patterns that you find online. So you can use the colonial dresses to teach your kids about history. It is a good visual as to how the women dressed back then. Also find materials that look similar to what was used to make the women's dresses back in those times. Many of the materials today are reminiscent of many time eras. 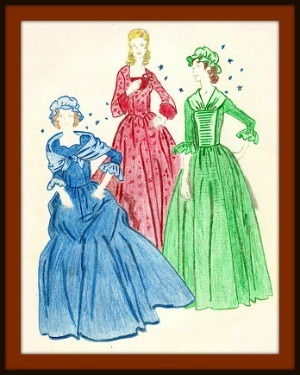 The colonial dresses had fitted bodices with full skirts. The sleeves were three-quarter length to long and either slightly poofed or with a ruffle border. For the outfits to be truly realistic, make some undergarments similar to what was worn in that time. The kids will spend hours playing with these dresses and making up stories to go with them. If you are just going to display the dolls after making them from the patterns, you can use more expensive material. Fancier fabrics can be found to make the dolls look better on display. But remember to keep them in the spirit of colonial times. Why spend money on patterns today when you can find them free. Don't you have better things to do with you money? Of course you do! You can buy more dolls and material to dress them up. Your sewing machine will be humming with happiness as you create all the dresses . Free patterns have all the same details in the instructions as the ones you buy too. This is important to know. You will not be cheated out of knowing everything to do just because the patterns are free. You will have fun making the colonial dresses and thinking back in time. Just think back then the women did not have the fancy sewing machines of today to sew their dresses. They had to hand-sew every single stitch. Just think if you had to do that today? You would not have time possibly to be reading this article! Check out the free doll clothes patterns today and make some colonial dresses for your eleven-and-a-half-inch dolls. You will love the fact that you have your machine to make the stitches rather than having to hand-stitch them all. Happy sewing and enjoy your handiwork! This ebook for free doll clothes patterns is given to you as a thank you for visiting my site. You may also be interested in the other patterns on this site. They are all printable sewing patterns and in a zipped pdf format for easy downloading. You can download this pattern by clicking on the link below.